All the fun of camping without the poison ivy. Camping is normally torturous, no thanks to unbearable temperatures, thousands of blood sucking mosquitoes and the ever-present threat of injury. In other words, we're just fine inside our urban jungle. 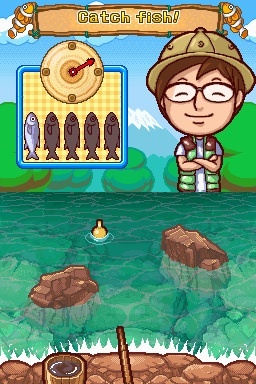 That said, we'll be more than happy to enjoy Camping Mama: Outdoor Adventures, Majesco's newest DS entry in the popular Mama franchise that has sold more than eight million copies in North America alone. As the title implies, this intriguing game kicks you out of the kitchen and into the wilderness, where Mama, Papa and their two kids hope to become one with nature. In addition to the campsite, there's a whole island to explore, including the forest, mountains and seas during the day and night. On that note, you'll choose one of the whippersnappers (brother or sister) and set off to find treasure and collect fish and insects while enjoying 38 missions and activities that include rock climbing, swinging on jungle vines, rowing a boat, tree climbing and spelunking. There's also stylus-based cooking and crafting games, like creating a fishing pole. You'll also sharpen knives and axes using stones, cook eggs gathered from chickens, make a fire, catch butterflies with a net and even pitch a tent. What's more, you can view collected objects in a scrapbook. We've grown a bit tired of the Mama series, but the variety of mini-games and exploration element could make Camping Mama: Outdoor Adventures a fun distraction. Look for it September 6.